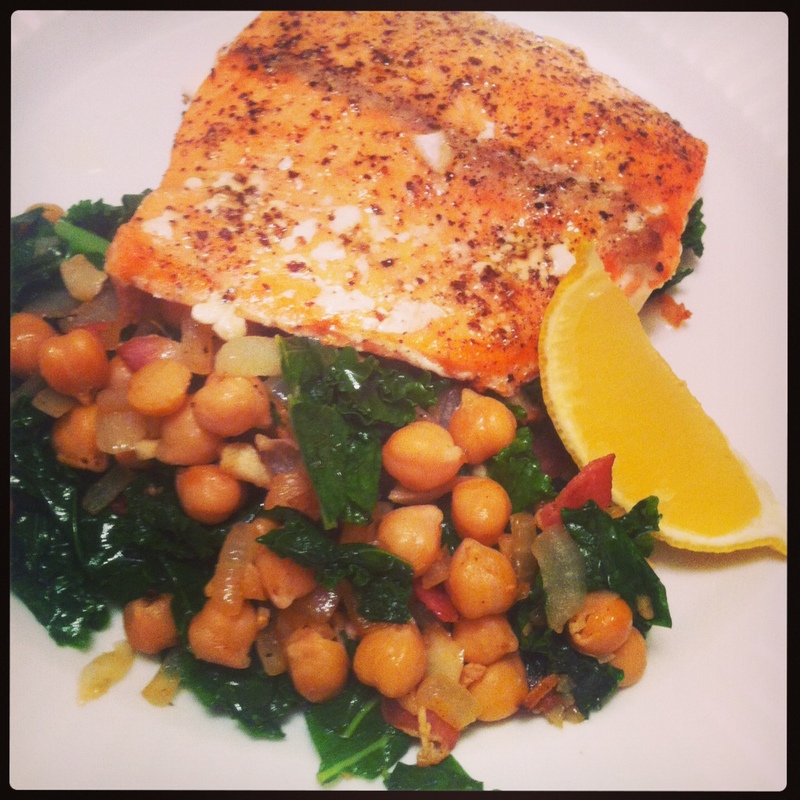 You are here: Home » Curly kale sauteed with garbanzos and bacon! Curly kale sauteed with garbanzos and bacon! Bet ya missed me, huh? I was off being a lazy blogger and eating some boring blog unworthy meals. The most difficult thing about this blog is sometimes finding the motivation to find new recipes and cook them and share them with you. Last week my dinner for 3 nights consisted of ground turkey with steamed vegetables and a salad. Who wants to hear about that?! Definitely not you guys. I get it. Sometimes I’m tired and I’ll make a sandwich for dinner. Or sometimes I’ll be a total fattie and order food from somewhere, eat it, feel guilty, and then eat ground turkey and vegetables for 3 days. So typical, Melissa. Anyway…..I recently started a boot camp (shoot me now please) and whenever I begin a fitness regimen I tend to be more conscious about how I eat and tend to eat healthier. So that’s good…I guess. I very rarely buy bacon but it was on sale so hey, sure! I cooked a killer breakfast this past weekend and had a few slices left over. What’s the best way to ruin an über healthy meal?? Duh, throw some fried bacon in there. Pshhh! I had this with a nice piece of Coho salmon so that made me feel better about the bacon I was consuming. I’m pretty sure they canceled each other out. In a sautoir (a pan with sides that are 2-3 inches high) fry bacon over medium heat until crispy. Pour out most of the bacon fat. Add onion and saute for a few minutes until opaque. Add garlic. Cook for another 2-3 minutes. Add the garbanzos and cook for another 3 minutes or so. Add kale. It might not fit all at once so add some, cover, mix with tongs, and when it’s reduced a bit add the rest of the kale. Cook until the kale is wilted. Season with salt and pepper and some fresh lemon juice if you like that sorta stuff. Drizzle with a bit of olive oil and serve!